Giant socks call for giant sock blockers, and because I think paying £20+ for plastic sock-forms is not for me I decided to call up my crafty side and make my own. A couple of years ago I came up with a good formula for making custom, perfectly sized sock blockers. I used this same technique to make my new sock blockers, though this time I managed to find the plastic placemats that I had searched for in vain last time. I bought two different types of placemats, both from Ikea, to make two sets of sock blockers. One in Giant size and one for normal sized feet. 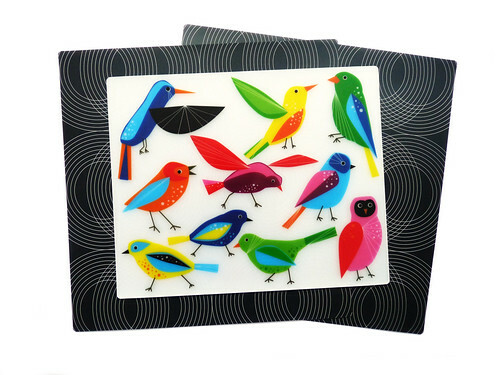 The frosted white place mats decorated with birds are KLISTRIG mats, prices at £2.39p for four. They measure 36x29cm, which is just about large enough for a UK6/7 sock, I’d say. I actually cut my pair of sock blockers from these mats and then cut an extra almost-rectangular piece, just narrowing slightly down it’s length, out of the excess of the mat to allow to slip into the leg of a longer knit pair of socks, such as my Rainbow Socks. The mats are actually pretty flimsy material, which while making it very easy to cut does make them more difficult to insert into a damp pair of socks. The black patterned mats in the background are part of the LJUDA range and are sold individually, priced at £1 each. 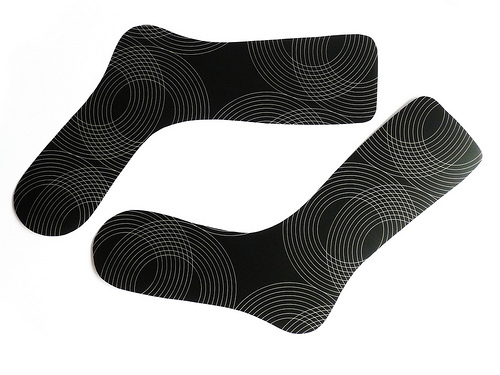 They are larger (37x37cm) making them perfect for even the UK size 12 sock blockers I cut from them, and they are also made of a sturdier plastic, which makes them easier to place into damp socks, though they are slightly harder to cut out with scissors. I’m extremely happy with my new sock blockers, and though they are not as wonderfully free as my cardboard alternatives they were fantastic for sock blockers in a hurry at a fraction of the price of buying a ready-made pair, and with custom measurements are sure to be pressed into regular use. Yay, you’re back!!!! Woo hoo!!! And in the meantime you’ve got a book out!! Well done you. So pleased you are happy and settled again. I’ll change my blogroll link. I only block gift socks. So to block, take a clean sock, put it on the blocker, and THEN wet it and block it. It’s easier to get the sock onto any blocker dry.